Show: Deal! Brats! | PowderKeg Live! The Modern Cafe is sponsoring some serious specials for this week’s show (because Jim Grell has gone freak-zone from spring weather, we think!). 1. There are a bunch of two-for-one tickets available on-line. If you haven’t gotten your tickets, do it now (that’s two tickets for $12 bucks… using our math skills… that’s $6 a ticket?). Use promotion code: spring. Get your tickets now to get the deal! 2. And, this is too good to be true for Herbach, a Sconnie… The Modern is giving away free brats to the first one hundred ticket holders outside the Ritz, starting at 12:30ish. 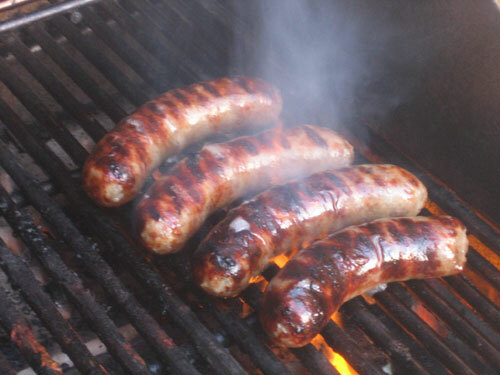 These are hand-crafted, organic, locally sourced, Jim Grell-made real brats! Amazing. Seriously. The Modern’s Brats will look even better. Those Modern Brats look mighty tasty! But what I really can’t wait for is what the Powder Keg crew cooks up.